The Sri Lankan government will construct a world-class beach park, at a cost of $300 million, next to a mega multi-billion-dollar port city project in Colombo. The beach park will be constructed between Kollupitiya and Dehiwala, reports Xinhua news agency. The cabinet of ministers last week gave its nod to the project, Megapolis and Western Province Development Ministry Secretary Nihal Rupasinghe said. Under the project, 85 hectares of beach land will be reclaimed through a landfill. According to Rupasingha, the National Aquatic Resources Research and Development Agency (NARA) has been given six months to prepare a feasibility report before the construction of the project is launched. 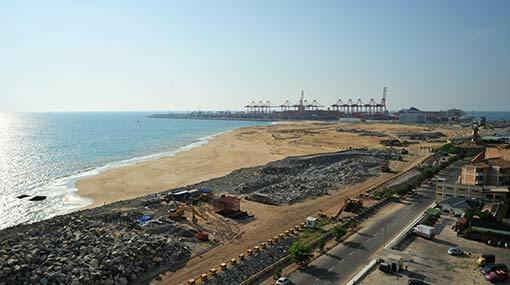 This artificial beach will complement the port city project. This will create a world class beach with numerous leisure activities and is expected to attract thousands of visitors, Project Director D.E.C. Jayakody said. The entire area will be able to accommodate up to 50,000 people at any time and will include a park for 3,000 vehicles, Jayakody said.